Recipe courtesy of USA Pears. Melt the butter in a large heavy-bottomed sauté pan over medium high heat. Add pears and cook, stirring occasionally, for 5 minutes or until softened. Sprinkle with sugar, cinnamon, ginger, and lemon juice. Season with a pinch of fine salt. Cook over medium heat, stirring occasionally, until tender, about 5 to 7 minutes. Keep warm. In a small bowl, combine the peanut butter, honey, and yogurt; stir until smooth. Set aside. To serve, place the pears in a shallow bowl. Top with yogurt mixture. Sprinkle over peanuts. Serve immediately. Nutritional Information Per Serving (1/4 of recipe): Calories: 396; Total Fat: 16g; Saturated Fat: 5g; Cholesterol: 11mg; Total Carbs: 61g; Fiber: 9g; Protein: 8g. 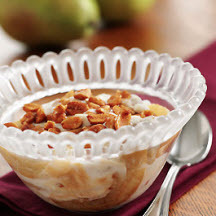 Recipe and photograph courtesy of USA Pears.